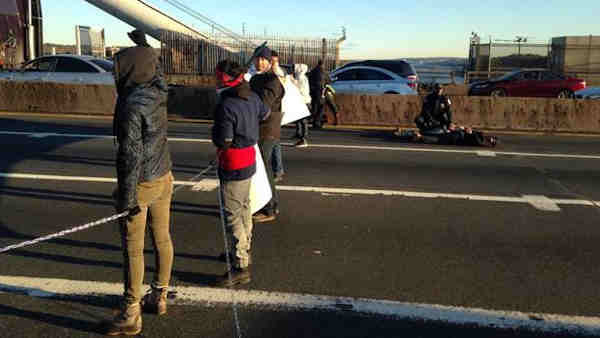 GEORGE WASHINGTON BRIDGE (WABC) -- Protesters chained themselves together and blocked the upper level of the George Washington Bridge Wednesday morning during rush hour. They were removed around 8:30 a.m. Ten people were under arrest, identified only as seven men and three women. The We Are Visible #SomosVisible protesters were demanding "equal rights for immigrants and political power for marginalized communities." The inbound upper level reopened by 9 a.m., with police activity in the right lane. The south walkway was closed to pedestrian traffic. A statement from the protesters said the group shut down the bridge for 45 minutes. "Immigrants and supporters shut down the upper level of the George Washington Bridge for 45 minutes during this morning's rush hour, declaring 'Somos visible,' or 'We are visible,'" it said. During the demonstration, the statement said, protesters chained themselves together and laid down, unfurling a banner reading "Resist, Organized, Act Up!" The group planned a rally at 6 p.m. in Union Square.